"Obadiah, Book of: consists of one chapter, "concerning Edom," its impending doom (Obadiah 1:1-16), and the restoration of Israel (Obadiah 1:17-21). This is the shortest book of the Old Testament. by the Babylonians, when Jerusalem was taken and destroyed by Nebuchadnezzar (B.C. 586). Obadiah (Obadiah 1:11-14) speaks of this capture as a thing past. He sees the calamity as having already come on Jerusalem, and the Edomites as joining their forces with those of the Chaldeans in bringing about the degradation and ruin of Israel. We do not indeed read that the Edomites actually took part with the Chaldeans, but the probabilities are that they did so, and this explains the words of Obadiah in denouncing against Edom the judgments of God. The date of his prophecies was thus in or about the year of the destruction of Jerusalem. 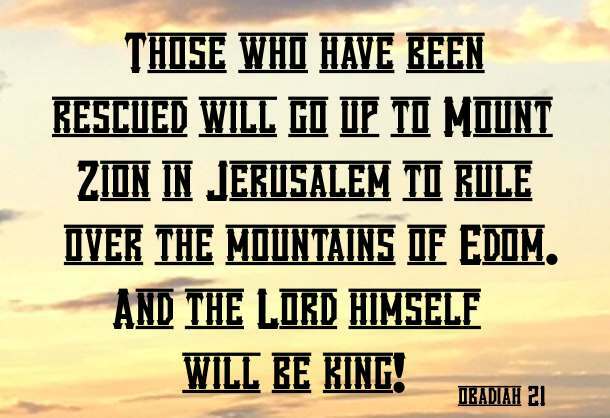 Edom is the type of Israel's and of God's last foe (Isaiah 63:1-4). These will finally all be vanquished, and the kingdom will be the Lord's (comp. Psalm 22:28)."